It is a town (with the population more than 4 thousand people), which is slightly inferior to its district center, Ilyintsi. Especially, in Ilyintsi, to which 22 km, nothing special to be seen . And in Dashev there is. Let’s have a look? Dashiv and Sob were merged into embraces. 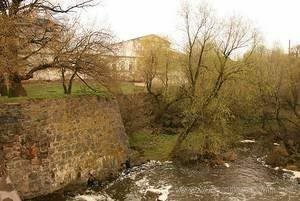 The town cannot be imagined without this river with rapids and large ponds on it. Without Dashiv Sob will lose a lot too. Dashiv was first mentioned in documents back in 1420 – along with Sob. At that time, on the watersides of the river, was a defensive castle, that was surrounded by shafts – at least Ukrainian historians say so. Poles are more cautious in dating – and therefore they sound more likely. 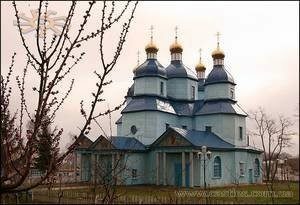 It is known that in the Middle Ages Dashiv belonged to the local Ukrainian landowners – Korovay-Sedlitskys. In 1585, Ostap Korovay-Sedlitsky sold his considerable estate to Prince Janusz Zbarazki, who managed to make Dashiv estate even bigger. So, according to the Polish version, the castle on Sob had already was built by Prince Janusz, and it was far from 1420. Why the prince needed a castle, of course: the Tartar Black Road passed by Dashiv. The shafts from the castle, maybe, are still visible, but wander in their search through a thick and marshy April mud I did not wanted. Zbarazkys were tormented with the rebuilding of the castle by every Tatars ride, and then eventually sold the Dashiv’s key to their brothers by the princely title – Vyshnevitskys. The last owner of Dashiv from the Vyshnevetskys family is Mikhail Servatsiy Vyshnivetskyi (1680-1744), the Polish- Lithuanian hetman . He was the one who took up his estate in a real way and did the most to raise Dashiv from its knees after being destroyed by invaders from the East. After Michael Servatsiy, Dashiv with the suburbs belonged to the daughter of Prince- Anna Oginskaya, the wife of the Trotsky governor. And after – her daughter Augusta (1724-1791), the wife of Earl Konstantin Ludwik Broel-Plater (Konstanty Ludwik Broel-Plater, 1722-1778), or, as he is called by local, Plater. Big Earl’s estates were in Courland, where his name probably did not sound so bizarre for the village ears. However, from the second half of the XVIII century Dashiv is closely associated with the Earls Broels-Platers. By the way, they also owned Volyn’s Berestechko, the grandson of Earl Constantine, Joseph Vincent Plater, visited it quite often. The Platers was not bother by the Tatars – so what, instead of the Tatars in 1750 and 1768, many trouble were caused by Haydamaks. And in 1785 Dashiv burned down in a fire. Only a few dozen houses was left – and this is from the whole town … Jozef Vincent decides to immediately rebuild Dashiv and even lay there his residence. From this it is easy to conclude that by 1785 there were no palace in Dashiv. The Earl personally followed the construction work, even plans for a future residence are credited to him. In 1787, his brother, an Inflands mayor Cazimir Constantine Plater, arived to Dashiv, with King Stanislav August Ponyatovsky on a way back from Kaniv. From his records, we know that at that time the residence was just starting to build. The works mostly were not in the old Dashiv but near it. Market square and the neighborhood at that time were renamed by Plater, for some reason , into a Augustuspol. It is also known that the residence at the beginning was conceived as a complex of buildings of various sizes and purposes. At the time of the visit of his brother only two houses were ready on the market square – the principal (the main) and the median (as it is in the document!). In them Plater hosted his guests. Everything else was a buildingground. Unfortunately, the Earl did not seen his dreams to come true. In addition, in the suburbs of the town there was a battle of Dashiv (May 2, 1831), when the Cossacks burned half of the residence. Since then, there were only two drawings by Antony Liange, dated 1825 (here they are represented as engraving by the drawings of Piller’s authorship). After the death of the Plater? Dashiv’s key, with area of about 5 square miles, was bought by – well, of course, of course – Stanislav Tschesny Pototsky, the owner of Uman and more than a dozen villages. On March 8, 1809, the owner of Dashiv, by the will of nobleman, becomes is youngest son Volodymyr Pototskyi (1789-1812). The guy was only 20 years old, and he already had the rank of colonel of equestrian artillery, and a wife, Tekla from Sangushkiv. That young man was unlikely to have even had a day to rule Dashiv: The property was disposed of by his stepmother, Sofia. Yes, the very same. From the early gone Volodymyr Pototsky-senior Dashiv, along with 10,885 “souls” of the serf got to his son, Volodymyr Jr. (1810-1880). And again, the history made a loop: the estate is ruled by a woman, a widow Tekla Pototska. Perhaps it was only for good: at that time, Tekla Pototska was more than a soft landowner and did not particularly offend her subjects. In each of her keys, she was holding a doctor, paying for a pharmacy and a hospital. Volodymyr Pototsky-junior was not looking for a welfare, but the fame and freedom, took part in the November uprising of 1830 – and was forced to emigrate from Russia. Nobleman settled down in Paris, where sincerely and with pleasure “burned” his life. Vladymyr have had more than enough money for such a way of life. In Paris, the gentleman married an … actress, Henryka Depres. The fact that he did not lose Dashiv estate is entirely a merit of a moderate and intelligent mother, a mentioned before Tekla. In 1848, not that youn g anymore Pototsky returned to Ukraine. The authorities been waiting for it, and condemned him to two years in prison. But all the punishment turned only into a residence in Kiev, even the rights for his property was renewed. 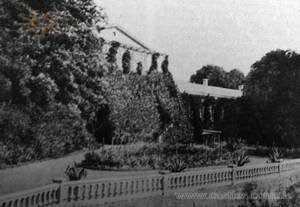 It was Vladymyr Pototsk, who rebuilt Dashiv’s estate after 1850, that was ruined after the fire in 1831. All fathers estates (Dashev and Podvysoke) are received by the only daughter of Vladymyr, Maria (1847, Paris – 1907, Kiev). It was her daughter, Sofia Zhevunska- Stefanova-Pidhirskay who inherited in 1908 Dashiv and Podvysoke (the total surface of 25 thousand hectares, including 3 thousand hectares of oak forests, as well as a considerable estate with a classic palace in the Red Village. What a such an estate is there? Not a pleasant testimony of the era at all. Despite the aesthetic insignificance, Pototsky and their posterity kept a considerable servants in Dashiv, and to the table at lunch it was rarely when less than 40 people were sat by. In 1872, a famous Belarusian artist and traveler, Napoleon Orda, visited Dashiv. Documentalist from the Orda was lousy, and if to be honest – as an artist he was not very talented too. Perspective often fell victim of the composition in its watercolors. This is exactly the case with the view of Dashiv by authorship of the Orda. Yes, the palace really was – and is – one-story, rising to the height of the second floor only in its central part. But the side-effects of one-story wings in reality are much longer than those depicted by a famous Belarusian. Till today, a significant part of the estate in Dashiv has survived. The park, however, remained only partially, in its western part. 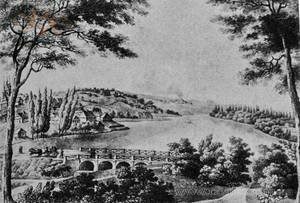 Even the dam with the river was once part of the Pototsky residence. The Four- volumes confidently dates the classic rectangular palace in 1887, it is difficult to say why. Now more interesting facade of the building, in the scaffolding – restoration or just repair? It is a pity that there are no preserved ornaments that once decorated the palace loggia. Horses are wandering around two-story stables from the granite and bricks that are built in 1887 – that’s right! And now, it seems, here are placed workshops of the orphanage that is located in here. But some time ago here were standing several carriages of the owners of Dashiv. As well, not very interesting one-story annexes near the main building are preserved , and the gate of the estate too. Did I mention that there is now an orphanage for mentally retarded children in the estate? Its inhabitants will be amazed to watch your camera and will greet you loudly. Many people are afraid of such places. I am – for some reason – not. It is not too difficult to understand that the former Dashiv was more extensive than the modern Dashiv: the popular way from Lipovets to Uman was passing by like an arrow. The road is still there, that’s cool: from Dashiv you can go not only to the district center, but also to Monastyryshche or Uman, but today this way is not the same. A hundred years ago,in Dashiv was five and a half thousand people – a thousand more than now. In the town then was a Roman Catholic chapel, and at the same time two Orthodox churches, and a synagogue with two prayer schools. Every two weeks here were markets, and once a year – a fair. In 1886, Dashiv even became a parish center! And in 1872, in the suburbs a Swiss, F. Ennie built a sugar factory. On the place of an old wooden mill a brickwork mill was build in 1881, which was rented by an Austrian H. Langer. His (Mill, not Austrian) buildings have survived to this day – they will be passed by an every tourist who goes from the estate to the St. Michael’s Church, another monument of the village, which is in the state register of architectural heritage as well. In 1895-97, two small cast iron mills in Dashiv being build – isn’t that an industrial center? Appeared and own distillery. In 1923 a part of Dashiv under the name of the New Dashiv was even lucky enough to become a district center of the Haysyn district. In the Second World War, the Germans did not take pity on the old buildings of the town: the numerous Jewish community of Dashiv lived in the central part of it.